Soft and delicate yet bright and sparkling, this fragrance blends uplifting notes of mandarin essence with the enveloping warmth of vanilla and Tonka bean. Refills for Dr. Vranjes Firenze diffusers allow you to reuse peacefully your beautiful bottle to make the most of your perfume. 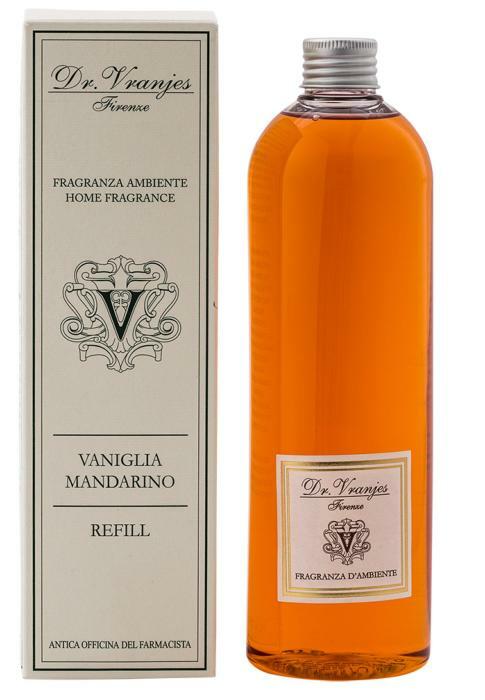 VANIGLIA MANDARINO : The citrus essence of the Tangerine, immediate and precious, spreads everywhere combining with the sweetness of the warm and passionate heart of Vanilla. Activity : A purifying fragrance, perfect for doing enjoyable, calming activities, especially, suitable for children's bedrooms. The "Soft Fruity" range are essences which evoke memories of childhood, past moments and small pleasures which reassure and accompany us with their unmistakable scents. Dr. Vranjes Firenze in Florence was created in 1983 from the passion of Dr. Paolo Vranjes , pharmacist, chemist and cosmetologist . Each home fragrance Dr. Vranjes Firenze is a unique creation , which are used in natural essential oils carefully measured , which contains at least 10% of perfume. Placing all the sticks in the bottle 30 to 60 minutes before returning . Then we recommend to return the sticks 1 times a day, depending on the desired intensity of the fragrance. In order to have a product with always perfect picture , we recommend also buy a refill of the same perfume and constantly added to allow the level above the curvature of the bottle. This caution extends the life Perfume . The duration of a perfume depends on the characteristics of the environment where it is located (space, ceiling height , openings , .. ) heating, direct sunlight and drafts , which can accelerate evaporation.